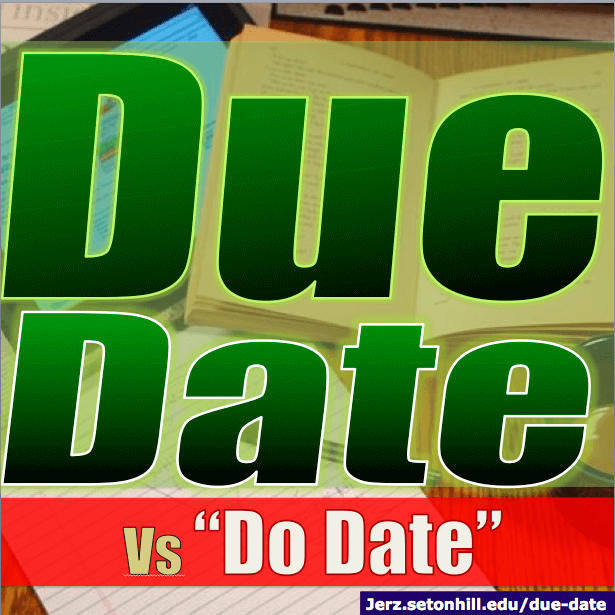 “Do Date” vs “Due Date”: Do Profs Really Have to Explain the Difference? If there really are teachers who list assignments by “do date” rather than “due date,” I’ve never heard from one. How likely is it that the student really *is* confused about whether Monday=Monday or Monday=Wednesday? How likely is it that the student is exaggerating a little, pretending to be confused in order to ease the consequences of falling behind? Thoughts? 5 Feb 2015 in Academia, Culture, Education, Ethics, Humanities, Literacy, Rhetoric. When I was in college the answer is “all of the above”. I got legitimately confused more times than I should admit, once or twice I exaggerated my confusion but for me those were cases like “Ok, it’s 15 minutes before class and…ooooooooooooooh s!@#! @, I completely misread this and thought it wasn’t due until later…crap, crap, crap…”. I didn’t personally lie, because frankly I really was scatterbrained sometimes and I just…didn’t. I knew several other people who did though, so some of the people are doing that.